The global recession during 2008-10 was associated with an accelerated decline in the number of traffic fatalities in 14 countries belonging to the Organisation for Economic Co-operation and Development (OECD) (ITF, 2015). The countries included: Austria, Belgium, Denmark, Finland, France, Germany, The United Kingdom, Ireland, Japan, the Netherlands, Norway, Sweden, Switzerland, and the United States of America. A shorter version of the report, with some additional analyses, has been published in Accident Analysis and Prevention (Wegman et al., 2017). 1. 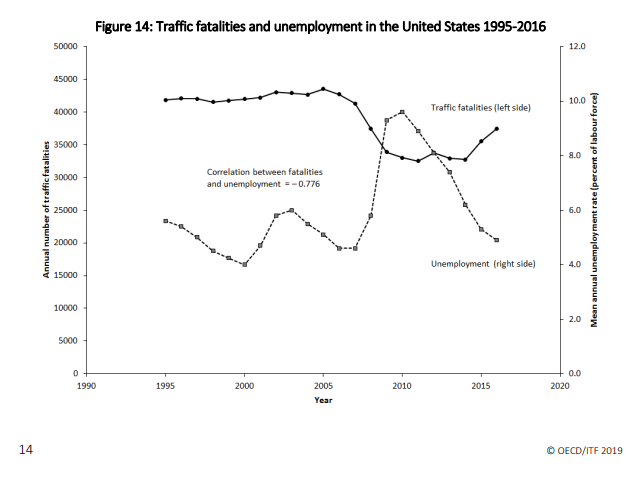 How are changes in unemployment related to changes in the number of traffic fatalities? 2. Is the relationship stable over time or has it become stronger or weaker in recent years? 3. Are traffic fatalities involving young people more sensitive to changes in the business cycle than traffic fatalities in general? Changes over time in traffic fatalities and unemployment are analysed separately for each country, as countries differ greatly with respect to changes over time in both variables of principal interest in this study. In most of the 14 countries included in the study, an increase in unemployment is associated with a decline in the number of traffic fatalities. The association between unemployment and traffic fatalities has become more consistently negative from 1995-2005 to 2006-2016. Traffic fatalities among road users in the 18-24 years age group are not consistently more sensitive to changes in unemployment than the total number of traffic fatalities. There is a tendency for the number of traffic fatalities to be weakly associated with changes in unemployment in countries that succeed in keeping fluctuations in unemployment within a narrow range. Download and read the full pdf “Updated Estimates of the Relationship Between the Business Cycle and Traffic Fatalities ” here.